As we are coming up on a full month of transitioning into our moveable home, I thought I should catch you up on what’s happened so far. The short version, at least. 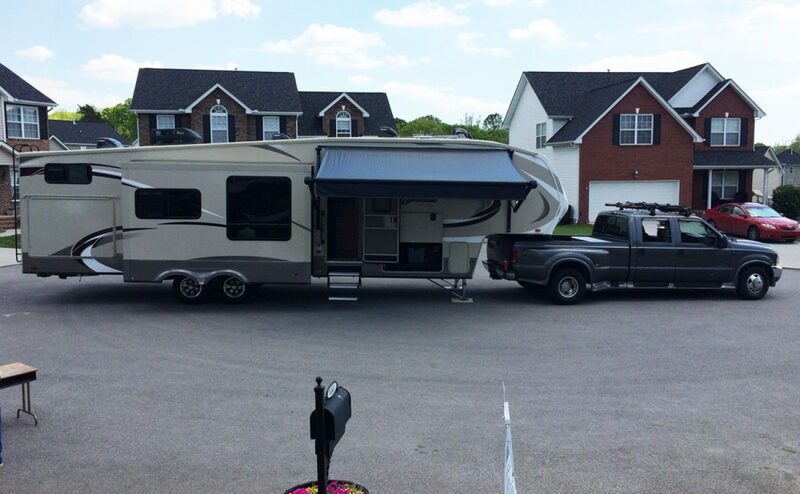 May 2, 2015 we picked up the 5th wheel (or as we like to call it, RockSteady). A few people had told us we should mount our electrical/brake line inside the bed instead of under the tailgate where it came factory installed. It was one of those things that we just didn’t have time to do before picking it up. We hook everything up and sure enough - our truck bed was too long and the cord was getting caught on turns. So 2 hours later, a new plug is installed in our truck bed, and we were finally on our way. We drove it back to our house so that we could fill it with things that we would need for the 10 days we would be at Norris Dam State Park. We didn’t want to take too much because the plan of being at Norris was that I would spend the 10 days painting the inside of the trailer and making it feel like home. We took out the huge couch that the trailer came with and I got right to work. I painted for a solid 3 days and then Jon and I were lucky enough to get a kidless 24 hours to go to IKEA in Atlanta and get a few things that we wanted to make the trailer feel more like home. As with any trip to IKEA, a few things turned into a car load and we barely got all the boxes shoved (literally) into the Sequoia. After lots of driving, we got back to the trailer and got to work putting it all together. Jon’s parents were so helpful with offering to watch the kids while we were fighting with minimalist Sweedish instructions. First up: chairs that when put together make our sofa and an ottoman that doubles as storage! We got also got our eating situation locked down with some sweet folding tables and stackable stools. Plus the laundry hamper that I’m kind of nerding out about, and a couple other little things. Ok, so maybe more than a few other little things. Slowly but surely we are making this tiny space our comfortable home. It’s amazing what a little bit of paint and non-rv furniture can do. Good pictures coming soon, we promise! Our time at Norris Dam State Park was great. We didn’t go see many things but we got so much done on our new home and we were really thankful to have that time to make it look like we had envisioned. Thank you to “Mimi and Papa” for always offering to help us with the kids so we can get projects done. You have been so helpful. Next up: An Indiana Wedding - and Rocksteady's maiden voyage.